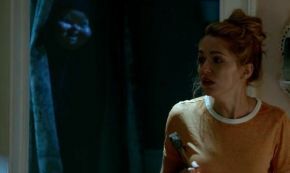 Happy Death Day has the ingredients to make a good horror-comedy, such as a masked killer, an interesting protagonist and a good murder mystery, despite the fact that it pretty much recycled the plot lines from Groundhog Day and other teen-slasher films. It does manage to deliver a fun film that you find yourself drawn into even if both genre’s tend to be a little uneven with each other. The story follows college student Tree Gelbman (Jessica Rothe, La La Land) who wakes up hungover in the bed of another student named Carter (Israel Broussard, The Bling Ring) and proceeds to go through the day treating everyone around her with contempt. We learn that it is Tree’s birthday which she is reluctant to acknowledge, and when she is on her way out to a party she is murdered by a mysterious figure in a mask, where Tree then awakens in Carter’s room and repeats the same day over and over again. To break the time loop Tree must continue to relive her birthday until she can solve her own murder. Whilst the story is nothing groundbreaking to what we’ve seen in previous slasher films, it still manages to be an entertaining watch although it does feel like more emphasis was placed on the comedic moments rather than the scares, as it does tend to rely on jump scares a little too much. The mystery behind Tree’s murder is the most interesting element of the film, as you try to guess who her murderer is and even when you think the answer might be obvious, you’d be surprised by the outcome. There are parts of the story that are a little formulaic, particularly with the transformation of the character that goes from mean girl to becoming more redeemable as well as the romance subplot between Tree and Carter, but for the most part, the scenes are played out well enough that you don’t become bored by it. We see Tree start off the film as a self-centred and spiteful party girl, almost making you wish that you don’t want to spend the entire film with this character. However as you learn a little more about her past that makes her act the way she does, you actually start to sympathise with her and hope that she makes it to the end of the film. Jessica Rothe’s performance as Tree is what definitely carries this film, she handles both her badass scenes and emotional scenes brilliantly that it helps you to root for her to solve her murder. Whilst her comedic timing is initially a little flat, she definitely improves as the film progresses. Israel Broussard also gives a good performance as Carter, although not as much focus was given to him as Tree, he does his best with what he has been given as he provides the more lighthearted moments in the film as he serves to be the voice of reason and emotional support for Tree. Happy Death Day might not have given us anything new story wise, but the murder mystery element and comedy both make it enjoyable to watch. Purple Revolver Rating: 4/5- a fun and thrilling mystery.